The promises made by “First-Century Modernism” are still worthy of being fulfilled, but a fundamental aspect has eroded in the past 60 years. Indeed, a cornerstone of purpose in architecture is the capacity to affect human emotions, to lift the human spirit. This is what creates the bonds that make societies strong. 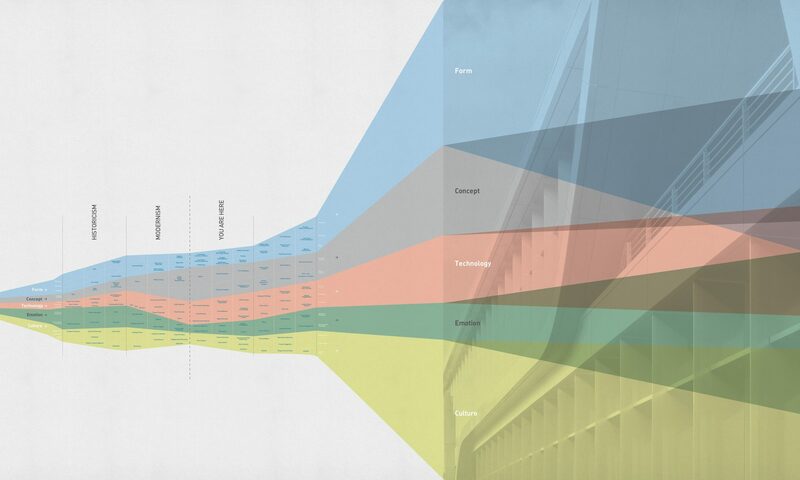 Modern Architecture, in countless manifestos written during the avant-garde period, did help give a programmatic direction to architectural action in the 20th century. Alas, in the myriad of design languages that were produced in that short time frame, Modern Architecture shines in far too few occasions, especially when compared to the global production of banal and mundane buildings. Second-Century Modernism is an alternative to First-Century Modernism and Post-Modernism. It emanates from those original promises, but does so with a particular strategy. It creates an architecture of abundance, richness, and community. Post-Modernism tried to achieve this through a mannerist period made palatable with irony. It offered a retreat from the collective alarm toward a raging modernity in the built environment, but resulted in a questionable architectural outcome that was short-lived when compared to the models it was referencing. While great progress was made in raising the consciousness about the link between architecture and the emotional reaction of the general public, it fell short in providing the rich environments that create community. In many ways, the theories behind Post-Modernism created a compelling goal, but did not go deep enough in terms of understanding how form affects culture and how the foundational processes by which we think about design—and how we actually design—had become out of balance with the goal of creating humane environments. We offer a working definition. Second-Century Modernism creates an architecture of abundance, richness, and community through placing a higher priority on Emotional Meaning, through a shift in the Design Process that balances the rational with the intuitive, and through a “Less + More” approach to expanding the range of Cultural Values we can inclusively balance in our environments. It welcomes you to embrace the paradoxical qualities of human existence. 1. Emotional Meaning and Cultural Vibrancy need to be primary determinants of design, in concert with the current hegemony of Concept and Function. Emotional Meaning in architecture occurs when the elements or the character of a space arouse an emotional response in the user that is meaningful, significant, and enduring. This can span a wide range of emotions “does an environment feel safe, welcoming, hopeful, or beautiful” or is it “oppressive, heavy, alienating, or empty”. Cultural Vibrancy is the summa of individual contributions pertaining the enrichment of human experience beyond attending to basic needs and given in urban settlements and rural settings where a sense of the collective is perceived. It is the sense of joy that makes life worth living with others that comes from the arts and social rituals that make up that culture. The richness of Cultural Vibrancy is the relationship between three values: Depth + Range + Engagement. 2. The Design Process needs to change—in the way we design and in the priorities that have been embedded in that process. For most of First-Century Modernism, we have emphasized the verbal over the visual, the mind over the heart. The intuitive has been branded as arbitrary and superficial. There are severe limitations that occur when we process our relationships with an exclusively linear, rational, and verbal thought process. Second-Century Modernism balances that with a three-dimensional, intuitive, and visual creative process. Second-Century Modernism, therefore, stands for the expansion of the architectural vocabulary to elicit a range of emotionally meaningful responses to the act of building and experiencing architecture (Image 2). Second-Century Modernism represents a new era in architectural action, where design is technologically advanced, aware of its lasting impact on the quality of people’s lives, and emotionally meaningful to its users. Second-Century Modern Architecture conveys a sense of geographical and cultural identity and exhibits poetic ambition. Steeped in digital technology, connectivity, and communication, the architecture of this new century is of necessity committed to provide tailored responses to the enormous socio-cultural texture of humankind; it embraces the wider spectrum of the human ecosystem. Rather than either/or, it moves forward to both/and. It balances a linear, logical, and verbal thought process with a multi-dimensional, intuitive, and visual creative process. It brings poetry back into design. Following First-Century Modernism, it has become clear that the world that architects design for is multi-dimensional, complex, layered, and inherently hybrid (Image 3). Coming from a century of conceptual absolutes and irreconcilable polarities, Second-Century Modernism promotes designing in a paradox of perceived opposites. This mode builds momentum on Dieter Ram’s “Less and More” design philosophy, a progressive step toward this fertile openness. Less and More remained, nonetheless, a clever version of the modernist minimalism that brought about these mixed results. Second-Century Modernism espouses the notion of Less + More, where the concept of abundance—as opposed to historicist opulence—is evocative of positive associations in design. This dictate makes of that paradox the entry point into a world that, with a First-Century Modernist lens, appears fractured, illogical, and irreconcilable (Image 4). Hence the paradox. What is the driver of any design in the presence of such apparent contradiction? Less + More equates to a design proposition thriving on the diversity of needs, desires, and ambition. And, in turn, it promotes a creative response to the enormous spectrum of human possibilities. The pioneers of First-Century Modernism invoked purposeful detachment from the reliance on bygone models of canonized classical beauty (Image 5). Historicism had engulfed architecture with a plethora of references that had imploded at mid-19th century. Something had to be done. Editing—the shedding of historicism from the art of building—became the most trusted tool for the growing number of hardliners. Through editing, a vast array of elemental compositions could be made expressive in their stylistic nakedness. It worked, for a while. That abstraction—elegant and informed at the onset—later got transformed into a form of unfortunate un-poetic emptiness. Restraint gave way to poverty of ideas, and Modernism reached a tipping point when it became the rule for new construction. The revolt to the impoverishment of the character of current cities is all the more remarkable because, that red light to Modernism, came straight from the masses it was supposed to serve. Urban blight was the recurring outcome of designing within the strict modernist formula. Loss of character; loss of a sense of place; loss of regional identity; and so forth are the indirect casualties of an architecture made out of Modernism, accepted without questioning (Image 6). There are marked differences between Post-Modernism and Second-Century Modernism. The former was reactive to a perceived decline of the built environment based on strict urban planning principles rooted in the heroic avant-garde of First-Century Modernism. The latter is a synthesis of the sustainable universals that First-Century Modernism uncovered in its subversive stance against the classical past with the earnest assessment of what type of spatial conditions this subversive ethos generated when it shunned foundational critical lessons from the pre-Industrial past. Post-Modernism made of history a stylistic all-you-can-eat buffet purporting a panache it never delivered in built form. Second-Century Modernism capitalizes on the realizations of the pioneers of the Modern Movement that architecture, technology, and space are deeply interconnected in addressing conditions of our time. This new movement builds on the precious reflections spun by the ruinous course of a Modernist utopia that was as destructive as it was unrealistic at the sunset of the Post-War boom. Post-Modernism was a fearful escape into an idealized past, whereas Second-Century Modernism is distinctly current and provocatively varied. In being a conceptually committed vessel for an architecture of action, the forms corollary to such philosophy remains as diverse as the individual designers that produce them. As an over-arching umbrella term, Second-Century Modernism is comprehensive of the hyper-technological and the vernacular, without favoring one or the other. It is both the intent and the historical awareness of the design producer and his/her patron that ultimately stake out the boundaries for the qualitative outcome of any project. The differences between Post-Modernism and Second-Century Modernism are more numerous than any prevision. This new century incorporates widely diverse input to arrive at the success of the architecture of the past without the stylistic traps. In that perspective, architecture becomes a matter of integration, rather than compromise. A coherent, open-ended, directional course of action expresses the vibrancy of this epoch in its constant mutation. Only a few saw in diversity a platform for richness, instead of contamination of a design message. Robert Venturi and Denise Scott-Brown made a case for the vernacular to be rehabilitated into the pantheon of design languages, and with that they withdrew from architects any cultural prerogative to design the environment. Second-Century Modernism gives that prerogative back to the architect. Bernard Rudofsky brought to the attention of the general public that an architecture without a signature has powerful import in the annals of architecture. Can this gap be bridged by combining design in its most convincing expressions within a much wider range to create a vibrant vernacular? On the other end of the spectrum is Frank Gehry’s statement that “98% of everything that is built and designed today is pure sh*t. There is no sense of design, no respect for humanity ….” Second-Century Modernism is a platform for the 98% by offering a wider arsenal of design options that are naturally more inclusive. These two semi-recent precedents bear witness to a pressing diversity to be factored in when designing in Second-Century Modernism. The debate re-opened: is there only one human type? Architecture was, is, and will always be a balancing act. The ability of architects to attend to as many demands placed on the project they are entrusted to design as they can is what makes a difference in the relevance of that piece of architecture in people’s lives. Architecture is both the background of human activity and foreground to the history of that very activity to posterity—a silent testimony over time of the efforts, aspirations, and culture of those who endeavored to build it. Simplifying this ambitious program through some trendy shortcuts or misunderstanding of genuine philosophical underpinning misses the underlying mandate of architecture to function at all levels—logistical and symbolic. Second-Century Modernism is filled with aspirations while being grounded in the practical. It is a plea to adopt the emotional richness of past and future architecture without thoughtlessly borrowing its forms. Second-Century Modernism puts into question the exclusionary approach to forms and styles. Fortified with the awareness of what was apprehended in the crisis of late Modernism, this new time engenders a theatre for resonant design that will be based on finding a dynamic balance point within complex systems to create an optimal outcome that is rich, vibrant, and engaging. Digital technology, connectivity, and communication are at the center of this larger paradigm shift in modern life. Architects are in the position to recast their own role in this new trajectory and make lasting built commentaries in the public realm. By linking to global trends while committing to the local, Second-Century Modernism’s dual dimension delivers a new way of being in the world. Modernism is getting a new 100-year lease. This expanded notion of Modernism impels Cultural Vibrancy, Emotional Meaning, and Community Engagement as three quintessential goals of a design for tomorrow. All with the hope that this will invite the public to fall in love with architecture once again.